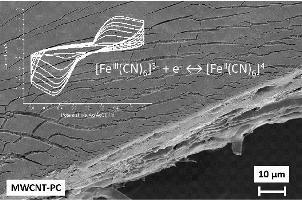 The electrochemical sensitivity and detection ability of a novel printed film consisting of multi-walled carbon nanotubes (MWCNTs) towards ferrocyanide / ferricyanide, [Fe(CN)6]3-/4- redox couple was investigated in aqueous potassium chloride solutions. The MWCNT-based film (further denoted as MWCNT-PC) was printed by means of flexographic printing process on polycarbonate (PC) substrate. For the electrochemical studies, the techniques of cyclic voltammetry (CV) and electrochemical impedance spectroscopy (EIS) were employed. The detection limit and the sensitivity of MWCNT-PC towards [Fe(CN)6]3-/4- were estimated to be 0.0191 µM and 1.707 A·M-1•cm-2, respectively. The MWCNT-PC film shows greater detection ability in comparison to other novel modified or unmodified electrodes reported in literature. The findings demonstrate that the printed MWCNT-PC film could be suitable for application in electrochemical sensing in microsystems.